The Angriest: Yowamushi Pedal: "First Day of Camp!" It is 23 December 2013, and time for episode 12 of Yowamushi Pedal. The Sohoku team head to a special cycling facility for a four-day training camp. On the way Onoda gets sick and is left by the road to wait for the follow-up van to pick him up. While there he meets Manami, an enthused cyclist from another high school. Once at the camp the first years learn their training regimen is simply - and almost impossible: cycle 1,000 kilometres in four days with modified bicycles designed to remove their specific riding strengths. Yowamushi Pedal appears to be produced on a relatively tight budget. I make this assumption because the quality of the animation is proving to be quite variable. Some episodes, usually the climactic racing-based ones, look rock-solid. Others, including this episode here, seem littered with shots that are comparatively substandard. The proportions feel wrong, and the perspective looks terrible. It is by no means a deal-breaker in terms of watching the show, but it does stand out. To a large degree "First Day of Camp!" is a pretty standard Yowamushi Pedal episode. There's a new task to achieve - building the strengths of the three first-year protagonists - and the execution of that task is littered with little facts and explanations on how to be a competitive cyclist. This episode there is material on such topics as why the type of wheels you put on your bicycle matter and how to most efficiently drink from your water bottle. It all adds up: if you're an impressionable young viewer the series is to a large degree educating you on how to cycle better, whereas if you're purely watching the show for entertainment these minor details really do enhance and flesh out the story. It is more entertaining to watch the race knowing exactly what is going on. The episode gives a proper introduction to Manami, a rival racer from another high school. He popped up briefly in episode 11 but Onoda actually gets to briefly meet him here. It is a nice introduction, and he looks set to be an interesting antagonist when the Inter-High Championship kicks off. 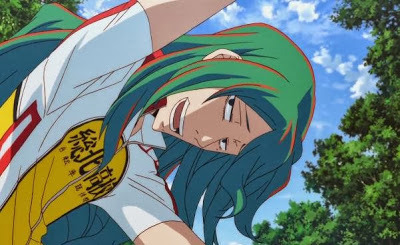 He is, seemingly innately, a nice person, so the inevitable conflict between him and Onoda on the road looks set to have a more good-natured competitive style than usual. I think that will help give the series some variety, since it seems inevitably that some of the rival racers are going to be a little less scrupulous or pleasant. Despite some odd appealing moments, however, this episode does seem to drag a little. The decompressed storytelling style hits it quite badly, and I can see another five-episode arc coming on dedicated to this 1,000km training ride. It is not awful, but I am struggling to recommend it on its own merits. We are 12 episodes into the series, but so far only 7 have been classified as 'good' or better. The quality ratio slips down to 58 per cent.